The Prankster has heard that ParkingEye are currently claiming to win more than 90% of court hearings. However, this does not correspond with the results being reported back to The Prankster. For the record, here is the complete list of ParkingEye cases reported to The Prankster this week. Case 1. Stayed until the Supreme Court judgment between ParkingEye and Beavis. ParkingEye wrote to the court a week before the hearing requesting a stay, but did not inform the defendant who turned up with their representative. The judge checked the paperwork and found that the court were due to write to the defendant that morning to inform them that the hearing was off. The judge agreed this was ludicrous. The defendant applied for a wasted costs order and the case was stayed. Case 2. In a case previously stayed until the Court of Appeal judgment, The Prankster supplied last minute advice on submitting a skeleton argument quoting the case of Aziz v Caixa d’Estalvis de Catalunya, Tarragona I Manresa  3 CMLR 5, amongst others, and suggested a further stay was requested. ParkingEye opposed the stay. The judge was annoyed with ParkingEye, pointing out that he was the same judge in charge of the previous hearing, and that he had ordered ParkingEye to wait 21 days after the Court of Appeal hearing in case Mr Beavis appealed. ParkingEye waited 5 days. The case was stayed until February 2016. Case 3. ParkingEye lost due to problems with their signage. Case 4. In a case previously stayed until the Court of Appeal judgment, the judge struck out defence arguments on pre-estimate of loss before the rehearing. The Prankster supplied last minute advice on submitting a skeleton argument quoting the case of Aziz v Caixa d’Estalvis de Catalunya, Tarragona I Manresa  3 CMLR 5, amongst others, and suggested bringing this to the attention of the judge to reactivate the arguments and also to ask for a further stay until the Supreme Court hearing. The judge ruled for ParkingEye, but stayed execution until the Supreme Court judgment. If Mr Beavis wins then the claim is struck out; otherwise the motorist has to pay within 21 days. He also struck out ParkingEye's claim for the motorist to pay the £27 POPLA fee. Case 5. The Prankster supplied last minute advice on submitting a skeleton argument quoting the case of Aziz v Caixa d’Estalvis de Catalunya, Tarragona I Manresa  3 CMLR 5, amongst others, and suggested a further stay was requested. ParkingEye opposed the stay. The judge stayed the case until the Supreme Court judgment, after which ParkingEye have 14 days to reactiviate the case if they desire. Case 6. 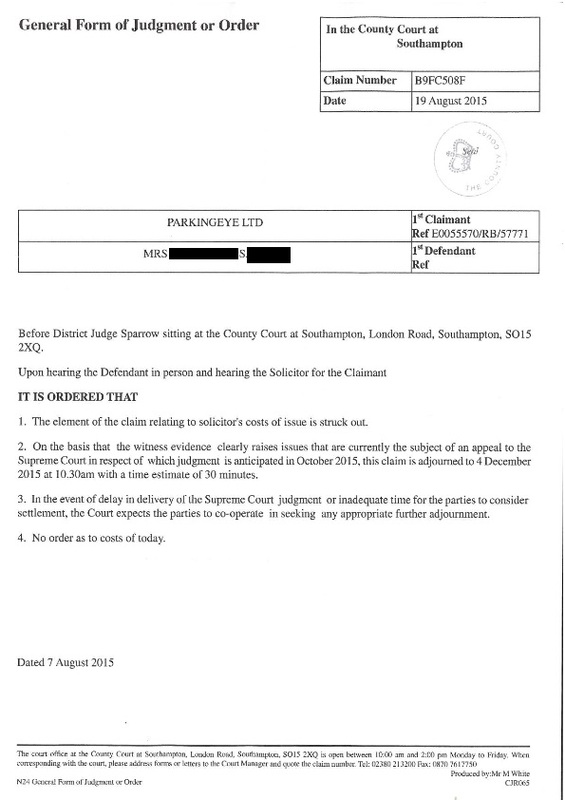 The case was stayed until the Supreme Court judgment, but in any case ParkingEye's solicitor fee of £50 was struck out. So out of 6 cases reported, ParkingEye have had 4 stayed, lost one and won the last, but only if the Supreme Court judgment goes their way. In two of the cases the amount ParkingEye can claim was reduced. This hardly seems like a 90% win record. It is possible that they do have a 90% win record, but this only illustrates that the other cases must be poorly prepared and that they are not using the correct legal arguments. The case of Aziz v Caixa d’Estalvis de Catalunya, Tarragona I Manresa  3 CMLR 5, is of vital importance. It is a European Court of Justice case, and therefore takes precedence on all lower courts, which include the Small Claims Track, Court of Appeal and even the Supreme Court. It was quoted in the Supreme Court hearing of ParkingEye v Beavis, but was not mentioned in the Court of Appeal hearing. It is therefore the highest court on record on these matters. Judges in the Small Claims track must give it precedence over the Court of Appeal judgment; this means that a Small Claims track judge either has to follow its judgment and rule for the motorist, or stay the case to see how the Supreme Court will interpret matters. 5.—(1) A contractual term which has not been individually negotiated shall be regarded as unfair if, contrary to the requirement of good faith, it causes a significant imbalance in the parties’ rights and obligations arising under the contract, to the detriment of the consumer. in order to assess whether the imbalance arises ‘contrary to the requirement of good faith’, it must be determined whether the seller or supplier, dealing fairly and equitably with the consumer, could reasonably assume that the consumer would have agreed to the term concerned in individual contract negotiations. It is clear that no motorist would agree to such onerous terms if they were able to negotiate freely and with professional advice. The general rule is that in cases of breach of contract, only the losses cause by the breach can be charge. In ParkingEye v Beavis there was no direct loss, of course, but ParkingEye's average cost per ticket issued is around £18. Looking at it another way, the council charge for an overstay is £50 reduced to £25, so it is clear a charge of £25 is sufficient to deter overstays and this may also be a possible result of negotiation between equal parties. However, £85 reduced to £50 would not. The judge […] held that the term did not cause a significant imbalance in the parties' rights and obligations because the charge was no greater than that which a motorist could expect to pay for overstaying in a municipal car park. However, not only was this reasoning out of line with the Aziz case, it was also factually incorrect because the charge for overstaying in a municipal car park in that area is £50 reduced to £25. The Prankster therefore believes it is imperative that in forthcoming cases, and until the Supreme Court judgment is available, the Judges attention should be drawn to the Aziz judgment, and also to the cost of overstaying in council car parks local to the case in question. The full Aziz judgment is available online. A printout should be taken to assist the judge. Many car parking operators today use SmartPhone technology, especially for self-ticketing. The solution is appealing - simply download an App to your SmartPhone, then use the camera to record contraventions and date and time stamp them before uploading them to the operator. 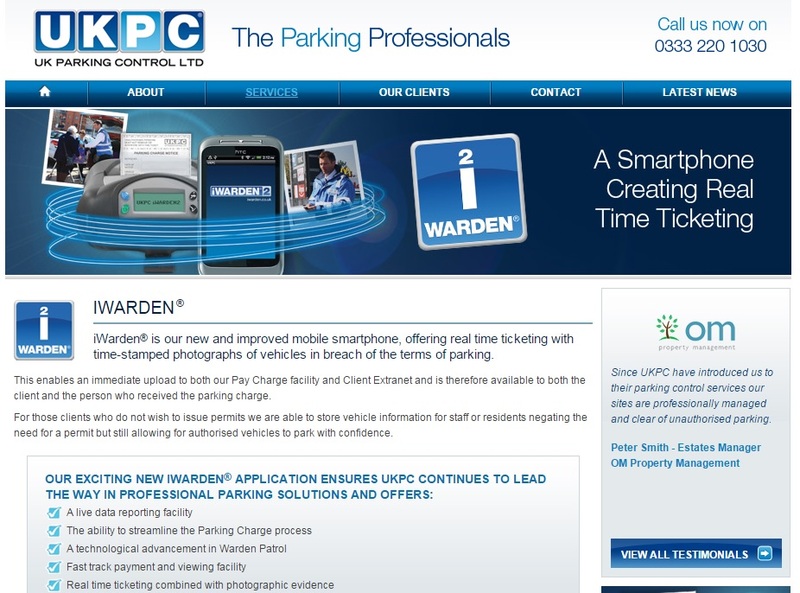 UK Parking Control use such a solution called iWarden2. The App can be downloaded to your SmartPhone, and then you are up and running, earning 10% of the revenue you generate. However, a number of UK Parking Control wardens appear to be abusing the system, by taking photographs with fake timestamps. 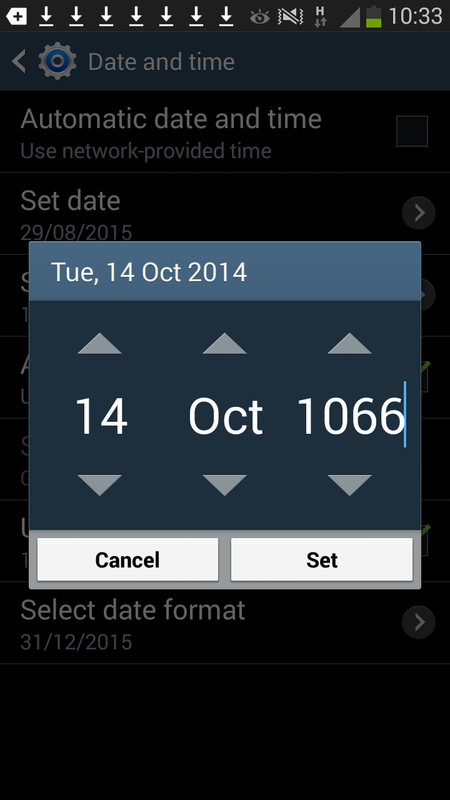 Presumably this is done by altering the time on the SmartPhone before taking a photograph. If done deliberately, this would appear to be fraud.The Prankster has received 5 reports so far, making a total of £500 apparently fraudulently demanded. This may be the tip of the iceberg and the true scale of fraud may be much larger. This of course sheds doubts on all operators who use SmartPhone technology. The Prankster calls on legitimate operators to declare if they have safeguards built into their applications to prevent fraudulent use. There are many ways to detect this type of activity. For instance, the App could monitor the time when it is running, and silently alert the operator if the time ever goes backwards. 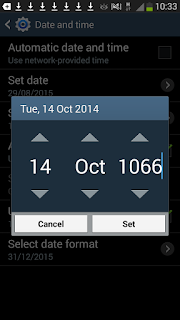 The App could also check system settings when it retrieves the time to check that the time zone has not been altered and also that the time is being provided by the network, rather than being manually set. This Android programming site gives some details on how this could be achieved. No doubt other devices have similar properties. Until this is done all tickets issued via SmartPhone are suspect. Another doctored UK Parking Control timestamp has emerged, making it the fifth brought to the attention of The Prankster this week. The story was reported in the Stoke Sentinel back in June. The motorist was accused of being parked at Lidl from 2.10 to 4.12. However, he only parked at around 3.20, which he knew because he was meeting a friend at 3.30. At the earlier time he was at the gym. UKPC initially rejected his appeal, but the gym provided him with a printout showing he was there at 2.11. Faced with this further evidence, the charge was cancelled. The motorist has reported the incident to the British Parking Association, who are investigating. The Prankster assumes (but has not confirmed) that UKPC wardens are using SmartPhone type technology to take photographs. The time on these phones can be easily manipulated. Here is a screenshot from The Prankster's phone taken while checking out rumours of an illegally parked horse during the Battle of Hastings. The ticket was later cancelled by Parking-One-In-The-Eye. They accepted that their signage was deficient, as it would not exist for another 900 or so years. It seems that UK Parking Control have a serious problem with honesty, with faked photographs now being apparently used in more than one car park. Three cases have now emerged, in just a week. This can no longer be attributed to the actions of one rogue parking warden eager to earn his commission. Instead, the problem seems to be across the board. If this is proven, then conspiracy to commit fraud may have occurred. In the latest case, reported in the Stoke Sentinel a motorist was issued a ticket for staying between 9.40am and 11.40am. 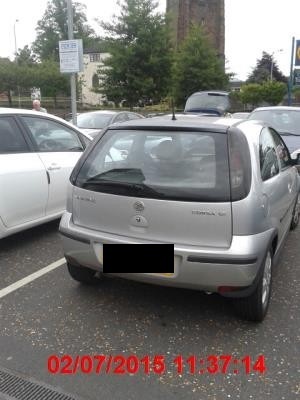 However, the motorist only visited the supermarket for 10 minutes, and was at home until 11am, then visited a friend before carrying on to the car park.. 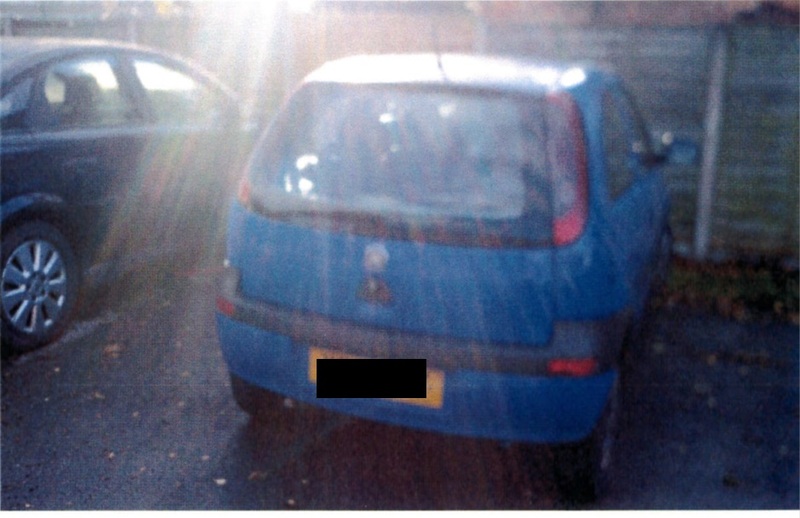 The time stamped pictures sent to the motorist showed the car surrounded by the exact same cars, including one with its boot open in both photographs, taken at 9.40 and 11.37. Here is the photo allegedly taken at 9:40. Note the white car to the left, the blue car to the front with the boot open and the black car to the right. Here is a photo taken at 11:37. Note the black car to the right is the same. And another picture at 11:37. The white car to the left is the same, and the blue car to the front still has its boot open. After two hours? Who are UK PC trying to kid? UK Parking Control stated; "All our photographic evidence is time stamped and this cannot be changed." Obviously this head in the sand attitude is an indication this whole debacle is carrying on with the tacit approval of management. This continuing situation throws doubt on the whole concept of issuing tickets using SmartPhone technology. Reputable operators urgently need to build safeguards into their apps, such that tickets cannot be issued unless the time is currently synchronised with UK time. Have you had a ticket from UK Parking Control where you dispute the times? If so, please contact The Prankster with details, including any photographs and the location where the incident occurred. prankster@parking-prankster.com. 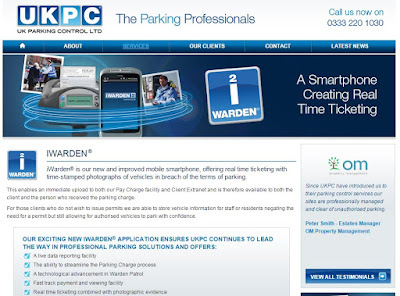 In a previous post,The Prankster drew attention to two threads on MoneySavingExpert where the motorists thought that UK Parking Control were fraudulently altering timestamps on photographs. 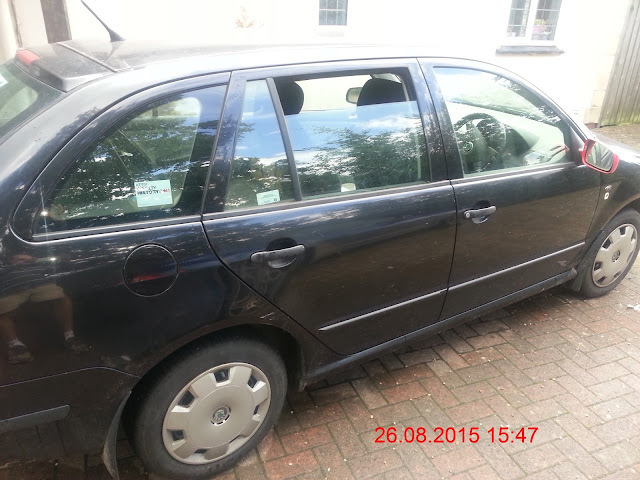 The Prankster has now obtained the photographs submitted to POPLA by UK Parking Control in one case. Here is a side by side comparison of photographs allegedly taken at 7:15 and 9:27. The photographs are not quite taken from the same place. Of special interest are the shadows. The Prankster has used an online shadow generator to generate shadows for the same date, times, and place. It should be noted that the photographs are using UK Summer Time, which is one hour ahead of UTC, so 7:15 becomes 6:15 and 9:27 becomes 8:27. 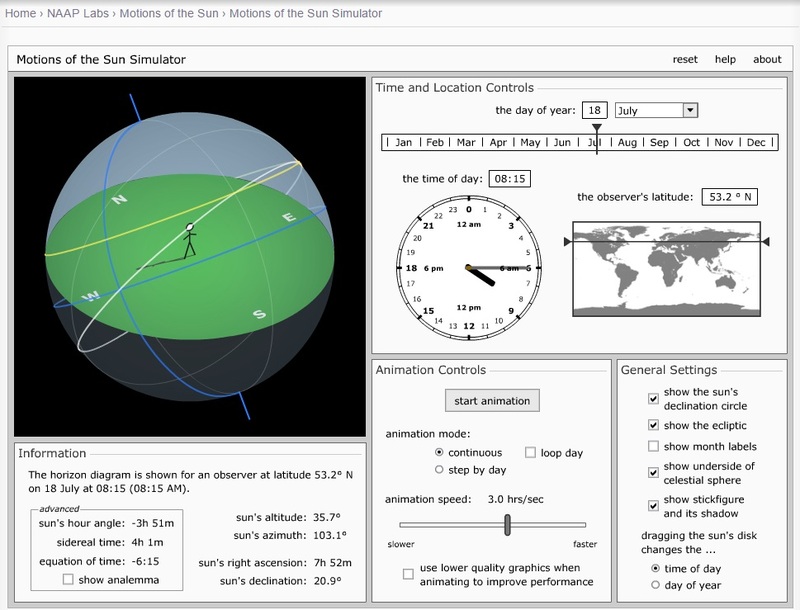 The yellow line is the sun's declination circle. The white line is the ecliptic. It can be seen that the shadow at 6:15 should be much larger that the shadow at 8:27. Additionally, the shadow should have moved significantly clockwise. Neither effect is apparent. This appears to be much more like the pictures above. The Prankster therefore suggests that the most likely scenario appears to be the the warden wound the clock back two hours, took a photo, wound the clock to the correct time, waited 10 or so minutes then took another photo. 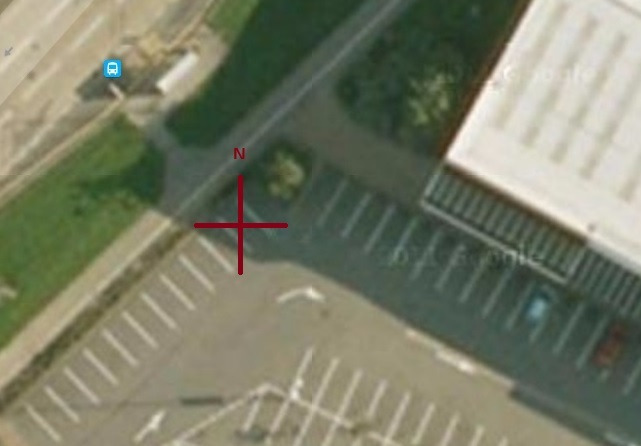 Here is an overhead of the parking space, showing North. Perhaps the best indication that the times are faked is the shadow of the lamppost on the building roof. (The Prankster thanks the eagle-eyed person who pointed this out - you know who you are). The left side shows the photo supposedly taken at 7:17; the right at 9:27. If these were really taken so far apart the shadow would have moved significantly. It has not. Here is a screenshot from Google Streetview showing the building and the lamppost. Although these photographs were taken from a different latitude and on a different day, they give the general idea of how shadows change over a few hours in the morning. The Prankster has acted three times as an expert witness, twice for the prosecution and once for the defence. In one case, the analysis helped secure a conviction. In the second it convinced the prosecution to drop the case. In the third, which happened after the trial but before the sentencing, the Prankster's analysis helped show the conviction was totally flawed and therefore unsafe. A retrial was ordered. The defendant took a plea bargain, admitted a single charge of disorderly conduct and was fined $100, rather than the 40 years sentence she was originally facing. However, none of these cases involved shadows, and The Prankster's analysis may therefore be wrong. This Pepipoo thread tell of a big Gladstone win today in court. Sadly the parking company District Enforcement, were not so lucky, and will no doubt have a bill similar to the following. Gladstones, as usual, have come out well on top, earning it appears far more than anyone else. The defendant reported that before the case Gladstones solicitor Jamie was 'very cocky' calling the claim an 'open and shut case'. More shut, it now appears, than open. 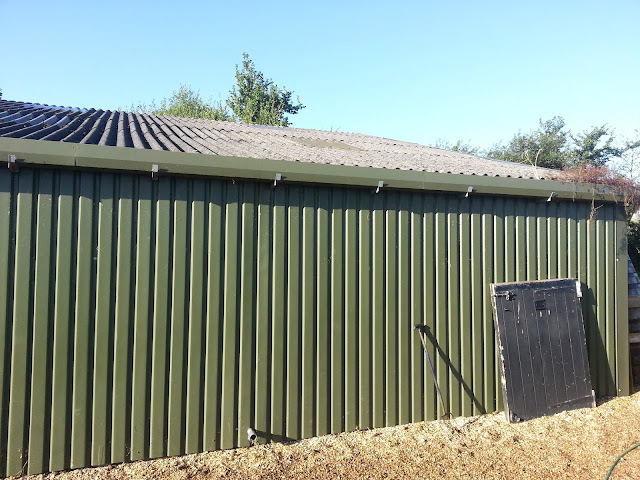 The judge rubbished the evidence, castigated District Enforcement for not providing a bundle, mentioning that every case may be struck out if their behaviour was repeated and there may be contempt of court proceedings. No doubt Gladstones will be happy to pocket another £100 or so for preparing a bundle. The solicitor DE used tried to make a fool of the defendant before the case, but the defendant ended up having the last laugh as the judge ripped her to shreds and made her look incompetent. DE tried to assert that the motorist was parked on land they controlled. The defendants case was that he was parked nearby on land not owned by DE. Unsurprisingly the judge was not impressed with the quality of the photographic evidence, which frankly could be a car parked in front of any wooden fence anywhere. The claim was dismissed with costs awarded to the defendant. The Prankster reminds parking companies considering using Gladstones that their standard fee does not include any kind of checking as to whether a case has merit or not. They will happily take your money and file any old claim you ask them to, but you will be footing the bill if it turns out there is no case to answer. The Prankster also reminds parking companies that results from the IAS have no merit and just because an IAS barista rules for a parking company has no bearing whatsoever as to whether there is any merit in the case. Two threads have appeared on MoneySavingExpert which are alleging that UK Parking Control wardens are fraudulently altering the clocks on their smartphones in order to boost ticket revenue. UKPC reject appeals stating "all photographic evidence is date and time sampled and this cannot be changed by the warden". While this may be true of the technology the wardens use, this is certainly not true of the smartphone The Prankster uses. For instance, here is a photo of a car The Prankster took just now after altering the time on his camera many years ago. And here is a picture taken after correcting the time much more recent picture of the car, which miraculously has not aged much. 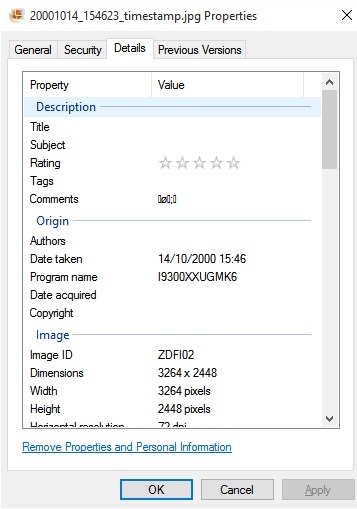 Here are the digital properties of the first picture, proving it was taken in 2000. And here is proof that anyone with a keyboard can digitally edit those same properties. 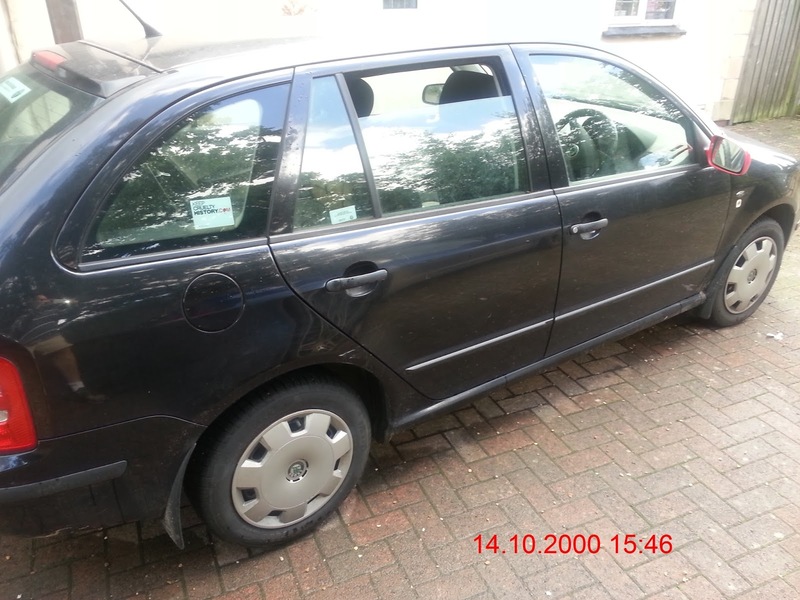 The photographs show the car at 2:06 and 4:18. However the motorist actually arrived at around 3:15, and can prove he was at a different place at 2:06 using CCTV evidence from other businesses. The photos are also apparently taken moments apart judging by the shadows and the other nearby vehicles. The Prankster suggests the second motorist also carefully checks the photographs for shadows and similar vehicles. The Prankster also suggests that both motorists contact the BPA as obviously this needs to be nipped in the bud, and if fraud is proven, sanction points awarded. How does POPLA fare against the ADR Entity criteria? The Alternative Dispute Resolution for Consumer Disputes (Competent Authorities and Information) Regulations 2015 came into force on 9th July 2015. Although they are not mandatory, they do lay down the criteria that an Alternative Dispute Resolution (ADR) body must match or exceed if they wish to gain the status of 'ADR entity'. This therefore is a natural starting point for any ADR offering. The DVLA when granting Accredited Trade Association (ATA) status to parking trade associations requires them to offer free ADR to motorists, but it does not currently require the ADR to be carried out by a listed ADR Entity, or even to match those required standards. The current offering of the Independent Parking Committee (IPC) was matched against those standards, and found to be severely wanting. Now it is the turn of the BPA's offering, POPLA, to be examined. It is however to be noted that POPLA is currently changing hands and the new system may operate in a different manner. In summary, the ADR offering passes on 30 counts, fails on 17 counts, with 14 counts unknown or not applicable. The service fails on 4 of 5 fairness criteria and 8 of the 16 transparency criteria. The recommendation is therefore that the DVLA carry out a full audit of the BPA appeals service and dependent on the results considers withholding ATA status unless the service can get up to the required standards in a reasonable timescale. It should be noted that the majority of the failure items can be rectified either by updating the website to provide more information, or by extending timescales allowed for appeals. The full analysis is as follows. dispute in circumstances where an ADR official responsible for the dispute is either employed or remunerated directly by a trader who is a party to the dispute. FAIL. Only the procedure for motorists is listed. The procedure for operators is kept secret. PASS (althought 'the form' referred to is not easily available. and of the Council of 21 May 2013 on online dispute resolution for consumer disputes(a). (h) ensures that where the operating model of its alternative dispute resolution procedure is to have a collegial body of representatives of both professional organisations or business associations, and consumer organisations, its ADR officials comprise an equal number of representatives of consumer interests and trader interests. (iii) can only continue to deal with the dispute if no party to the dispute objects. FAIL. Method of appointment and duration are not publicly available on the website. The names are listed in the Annual report, so only on a retrospective basis. (p) the annual activity report required to be prepared under regulation 11(2). FAIL. The motorist is not informed. need to conclude the alternative dispute resolution procedure. (e) notifies the parties of the outcome of the alternative dispute resolution procedure on a durable medium and gives the parties a statement of the grounds on which the outcome is based. FAIL. The outcome is notified by email only. (d) before expressing their consent to a proposed solution or amicable agreement, are allowed a reasonable period of time to reflect. (b) obliged, under an enactment or under the rules of a trade association to which the trader may belong, to participate in an alternative dispute resolution procedure. (b) obliged, under an enactment or under the rules of a trade association to which the trader may belong, to accept the solution proposed by the body if the consumer accepts the solution. PASS. Solutions are non binding on the consumer. (ii) where the law applicable to the sales contract or service contract is determined in accordance with Article 5(1) to (3) of the Rome Convention of 19 June 1980 on the law applicable to contractual obligations(a) the solution imposed by the body does not result in the consumer being deprived of the protection afforded to the consumer by the provisions that cannot be derogated from by virtue of the mandatory rules of the law of the member State in which the consumer is habitually resident. l.
(f) dealing with such a type of dispute would seriously impair the effective operation of the body. 14. The body ensures that its policy regarding when it will refuse to deal with a dispute, including in relation to the level of any monetary threshold it sets, does not significantly impair consumers’ access to its alternative dispute resolution procedures. 15. Subject to paragraph 16, where a body refuses to deal with a dispute, it must, within three weeks of the date upon which it received the complaint file, inform both parties and provide a reasoned explanation of the grounds for not considering the dispute. 16. Where following the expiry of the period referred to in paragraph 15, it appears to the body that one of the parties has sought to mislead the body as regards the existence or non-existence of one of the grounds for it to decline to deal with a dispute, the body may immediately decline to deal further with the dispute. FAIL. 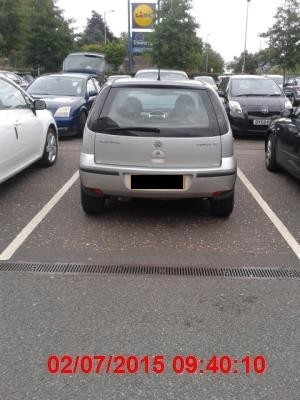 Any reasonably competent body should be able to detect that the parking operators regularly seek to mislead the body. The current offering of the Independent Parking Committee (IPC) has been matched against those standards, and found to be severely wanting. In summary, the ADR offering passes on 17 counts, fails on 33 counts, with 11 counts unknown or not applicable. Crucially the service fails all 5 of the fairness criteria and 11 of the 16 transparency criteria. The recommendation is therefore that the DVLA carry out a full audit of the IPC appeals service and dependent on the results withholds ATA status unless the service can get up to the required standards in a reasonable timescale. FAIL. Although postal submission has been know to happen, it is not explained how to do this. FAIL. No exchange of information occurs. Operator submissions and evidence are kept secret. FAIL. As the officials are not named, this cannot be guaranteed. (h) ensures that where the operating model of its alternative dispute reolution procedure is to have a collegial body of representatives of both professional organisations or business associations, and consumer organisations, its ADR officials comprise an equal number of representatives of consumer interests and trader interests. FAIL. Only electronic applications are easily accessible. Even they are not easy. Cut and paste is not allowed in the appeals box, meaning the entire appeal has to be typed out at the time. FAIL. The motorist is not allowed to comment on the information. Even if they were allowed to see it, no changed can be made once the appeal is filed. FAIL. The outcome is notified by email only. Where motorists win appeals often no grounds are given, giving rise to the suspicion that a certain number of appeals are allowed to make up the numbers. In the recent ParkingEye v Beavis hearing at the Supreme Court, ParkingEye's counsel, Jonathan Kirk, spent a great deal of time trying to persuade the judges that it was parliaments intention when passing the Protection of Freedom's Act 2012, that arbitrary parking charges would be allowed. As this extract from a letter from transport minister Norman Baker to Andrew Selous MP shows, parliament thought nothing of the sort. In ParkingEye's case, the average cost per ticket issued is around £18. 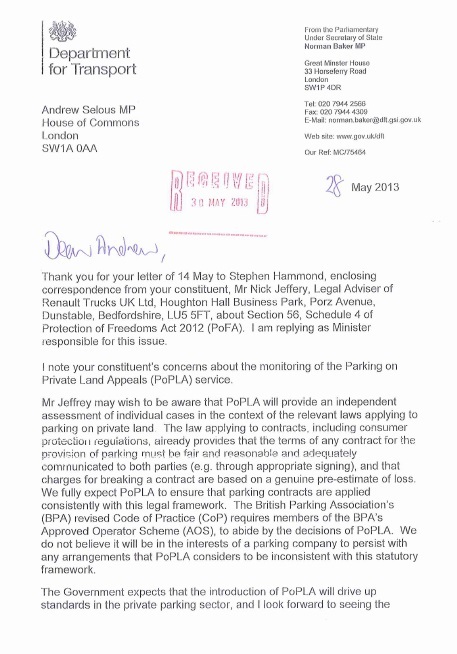 It is clear from this letter that parliament have no support for the £85 to £100 ParkingEye charge in their car parks and that parliament expect appeals services to 'ensure that parking contracts are applied consistently with this legal framework'. ParkingEye cannot rewrite history and pretend their charge levels are supported by parliament. When ParkingEye file a parking claim they always include an amount of £50 for solicitor filing costs. 45.1(1) This Section sets out the amounts which, unless the court orders otherwise, are to be allowed in respect of legal representatives’ charges. 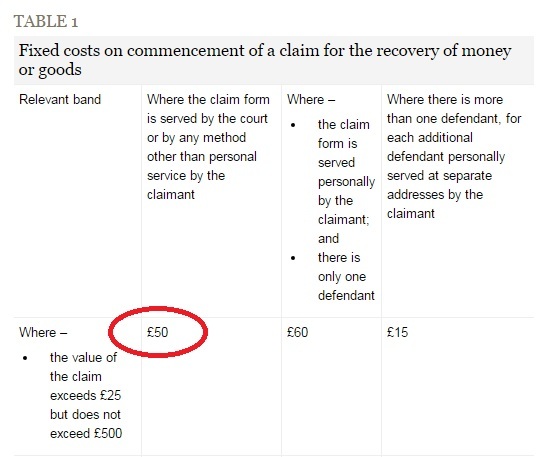 Thus, if a solicitor charges £100 to file a claim, the claimant would only be able to claim £50. If a solicitor charges £20, on the other hand, then the claimant would only be able to £20. They cannot claim £50, pass £20 on to their solicitor, and pocket the rest. In most cases, it would seem extremely unlikely that a solicitor would pick their nose for £20, let alone file a claim for that amount. 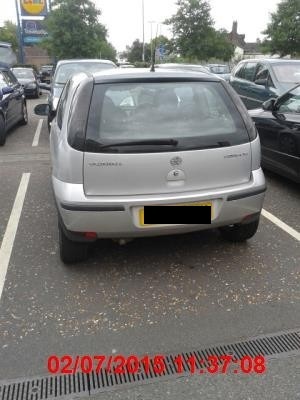 However in ParkingEye's case, the situation is complicated because they do not pay an external solicitor to file a claim, but do it using the name of their in-house solicitors, Rachael Ledson or more recently Rossana Breaks. This means that there is no invoice which can be produced by ParkingEye to show they were charged £50 or more by a solicitor. An in-house solicitor is allowed to charge for the work they did (or persons supervised by them did) in filing the claim; however, the important point here is that they must charge for the work actually done - not an arbitrary amount. Last year, ParkingEye filed over 30,000 claims. 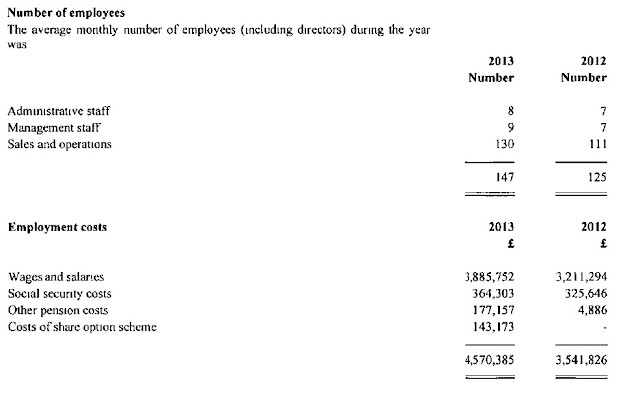 That is a total of 30,000 x £50 or £1,500,000 in solicitor's filing costs. It is difficult to see how ParkingEye can justify this amount. They cannot possible pay Rosanna Breaks anywhere near that amount. 30,000 claims is 115 claims a day, or 14 an hour (for an 8 hour working day). If Rosanna Breaks worked flat out with no holidays, no time to eat and no toilet breaks she would still have to file one claim every 4 minutes. 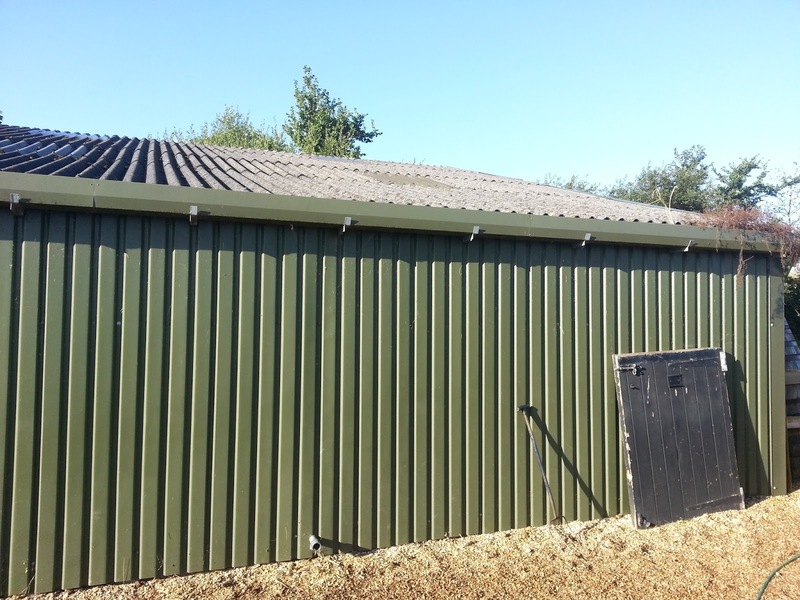 At £50 a time this is an hourly rate of £700. Obviously ParkingEye's barrister Jonathan Kirk is in the wrong job. Of course, as we can all deduce, ParkingEye's filings are almost completely automated. The text consists of one of a few templates filled in with the specific details of the claim. 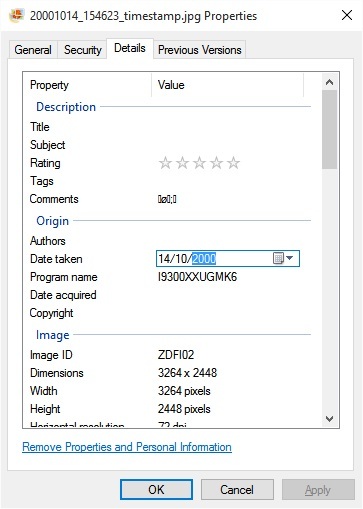 There is no signature needed; a typed name is sufficient for filing bulk claims. If any checking is done this would be surprising, given the amount of claims filed where the defendant is out of jurisdiction. Rosanna Breaks has even filed claims when the defendant has replied to the letter before claim and has confirmed that she was powerless to stop the automatic filing. ParkingEye's next accounts are due by September 30th 2015. Their last accounts showed their salary costs to be around £4.5 million pounds. The Prankster previously published the job titles of all 166 ParkingEye employees, showing that in November 2013 there were only 2 people in the legal department, the Head of Legal and a paralegal. There were also 5 people in the claims team. It does seem unrealistic for ParkingEye to claim that 1/3 of their salary costs are needed to file 30,000 claims a year while the rest of the cost runs the entire remainder of the operation. And indeed, this is the case. A letter from ParkingEye's head of legal, Rachael Ledson, confirms this. Ms Ledson states that the costs are in fact nothing whatsoever to do with costs 'on commencement of a claim' but in fact she has lumped in other costs because 'the required attendance on the file takes place for several months prior to the date of issue'. 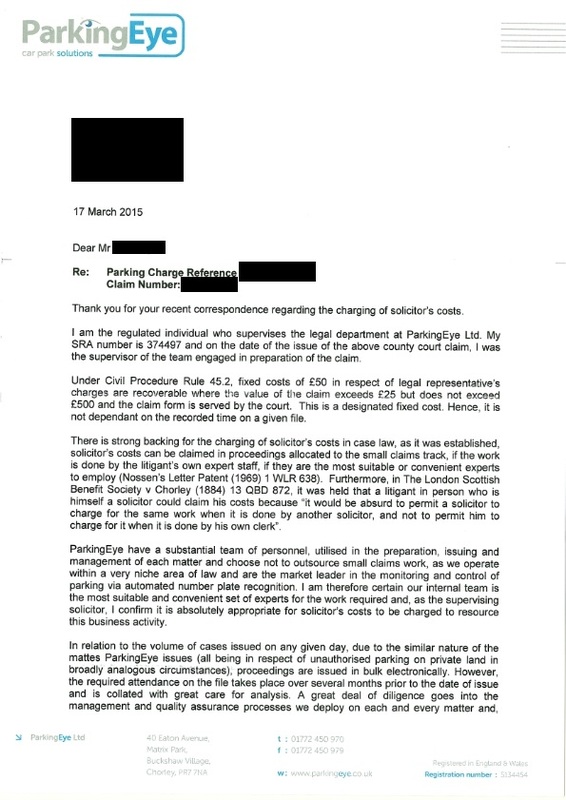 As ParkingEye typically issue a claim 14 days after sending the Letter Before Claim filing then it is clear that the several months of attendance are to do with the normal process of parking charge collection, and have nothing to do with the commencement of a claim. This of course, was apparently the view of HHJ Moloney in the ParkingEye v Beavis case. HHJ Moloney ordered Mr Beavis to pay £135, which comprise the £85 parking charge, the £25 filing fee and the £25 hearing fee. He did not include the £50 solicitor filing fee in the amount Mr Beavis had to pay. This is also the view of District Judge Sparrow in Southampton. On 7th August he issued the above order staying a case until the Supreme Court judgment is available, but also striking out the £50 solicitor costs. 1) The element of claim relating to solicitor's costs of issue is struck out. The Prankster recommends that any motorist contests the £50 filing cost, and submits the above judgment of DJ Sparrow as evidence. This advice applies not only to ParkingEye claims. 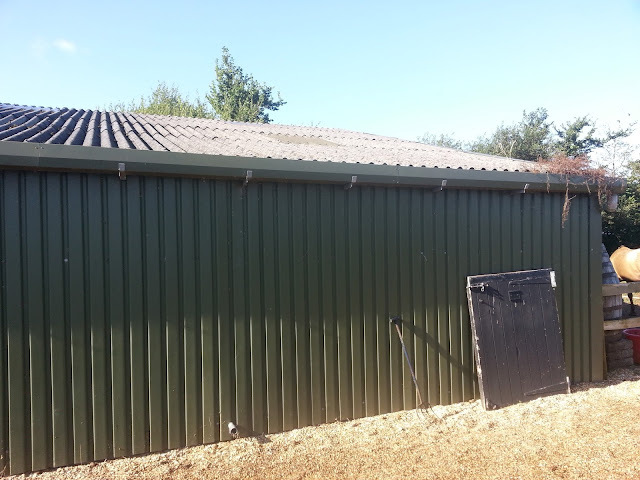 Civil Enforcement Limited is known to claim £50 as the filing costs the solicitor Michael Schwartz charged them. However, they have never substantiated this amount despite umpteen request and it is therefore suspected he charges them much less and they pocket the difference. CP Plus and Moto accounts both refer cryptically to a settled legal dispute. This appears to be the early termination of CP Plus's parking contract with Moto. The MOTO accounts show a profit of £7.2 million from a parking contract termination. 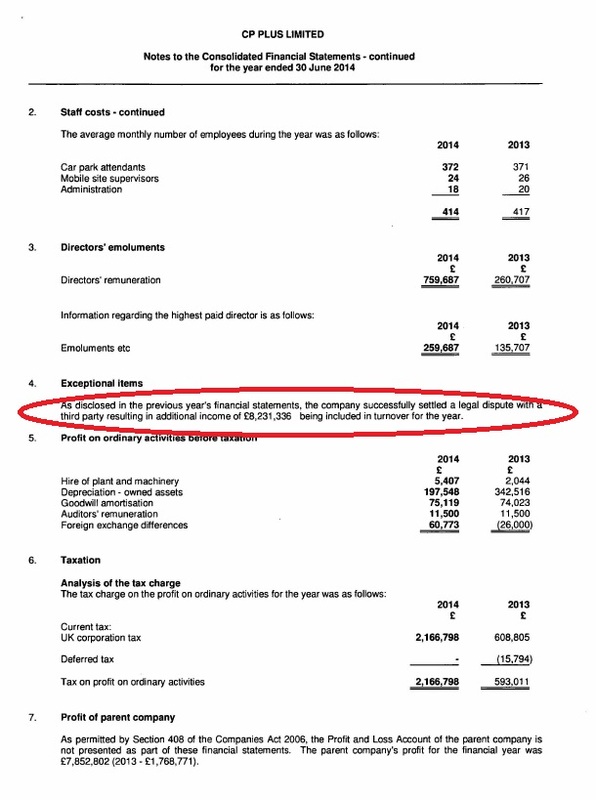 The CP Plus accounts show an Exceptional item where a legal dispute is settled raising an extra £8.2 million. As both parties cannot have made a profit from terminating a contract, The Prankster makes the reasonable assumption that Moto originally made provision to settle for £15 million, but settled for £7 million. It appears the money was burning a hole in CP Plus's pockets, because they have now apparently taken over Highview and Ranger Services. Grahame Rose, Ian Langdon, Tamsin Rickeard, and Elliot Morris all became directors of Highview on 2 June 2015. Simon Leigh and Melvil Corin left on the same day. 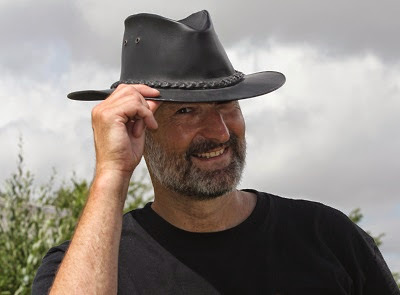 Russell Corin became a director of Ranger Services on 1 June 2015. Grahame Rose, Ian Langdon and Tamsin Rickeard, all became directors of Ranger Services on 2 June 2015. Simon Leigh left on the same day. Grahame Rose, Ian Langdon, and Tamsin Rickeard are all longstanding directors of CP Plus. The British Parking Association are fond of saying there is no such thing as free parking, and this apparently demonstrates that. Landowners who contract in parking management companies on the basis that they are free and will make all their money from targeting their customers soon find out that they have made a bad deal which is difficult to get out of. Their customers complain heavily and move their business elsewhere. The loss in reputation damage and customer retention soon dwarfs any money saved from paying a reputable parking company to manage parking. 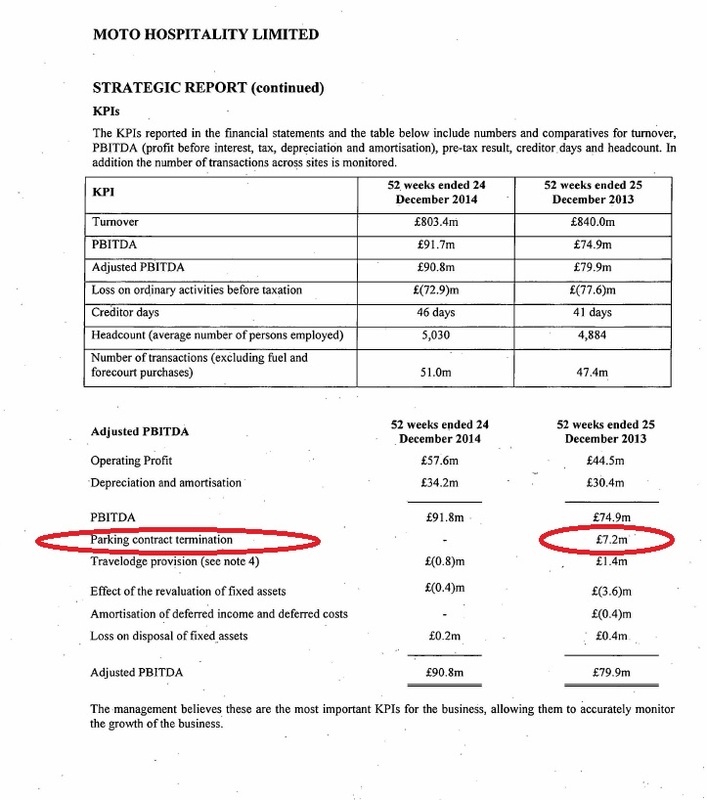 Somerfield found this to their cost when ParkingEye started damaging their business. They had to pay £300,000 to get rid of the parking parasites. B&Q found this next, when they had to pay a reputed £400,000 to get rid of ParkingEye. (Business is now returning now their parking is being managed in a sensitive way). Now Moto have joined the not-so-free-parking-club. Although the reasons for early termination are not disclosed, The Prankster paraphrases Occam's razor; the most likely explanation is the one which makes fewest assumptions. The most likely explanation, The Prankster believes, is that the contract was terminated due to customer dissatisfaction. The operation of POPLA is changing. Although the new system starts in October, new appeals cannot now be fully registered. Instead, you must register your intent to appeal, and when you are then contacted by Ombudsman Services you will then be allowed to register your full appeal. The full press release is on the old POPLA web site and is reproduced below. On 1 October 2015, the operation of POPLA is passing from London Councils to Ombudsman Services Limited. 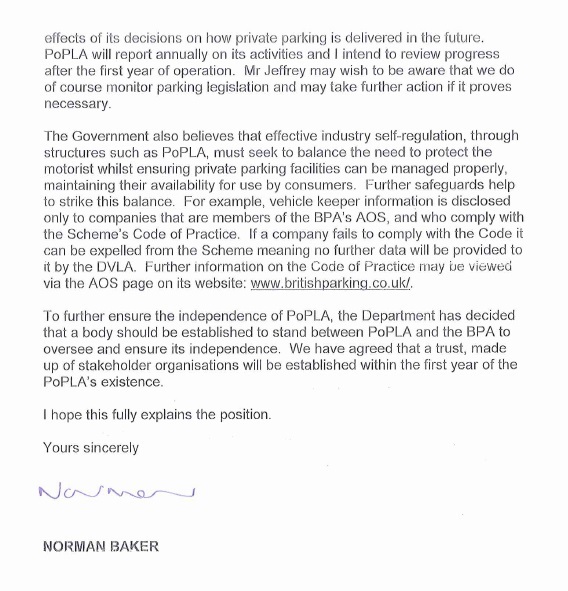 As part of the transition process, the British Parking Association has asked London Councils to cease registering new appeals from 21 August 2015. However, once you have been notified that we have received and forwarded your intention to appeal, no further enforcement action can proceed until after the appeal has been finally decided. Any delay in appeals being registered obviously does not affect the strict requirements, including time limits, provided by Schedule 4 to the Protection of Freedom Act 2012, from applying. 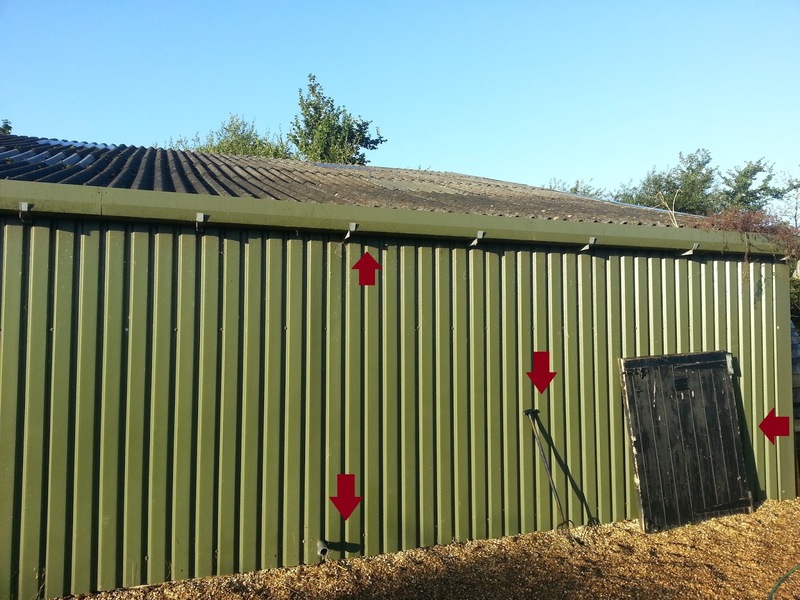 Equally it does not affect the requirements of the BPA Code of Practice regarding dealing with original representations within the timescales provided. To find out how to register an intention to appeal with the Ombudsman Services Limited, please click here, which will take you to a new page. Assessors at London Councils will not determine any appeals after 30 September 2015, whatever date they were registered. The statement of the Lead Adjudicator regarding cases adjourned pending handing down of the decision of the Supreme Court of the United Kingdom (available here) remains in force.